Parties are popping up everywhere this month, with graduations and weddings and anniversary celebrations happening. 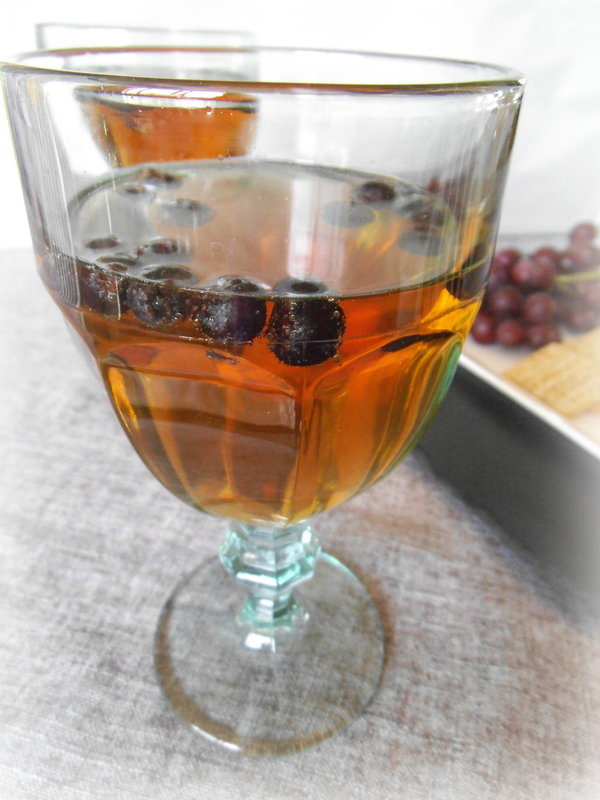 And to celebrate with a glass of punch is certainly appropriate and desirable in this case, thanks to the berries. I’ve rarely met a punch I don’t like, and though I’ll drink it in any colour, I prefer to tint mine with mostly natural ingredients. 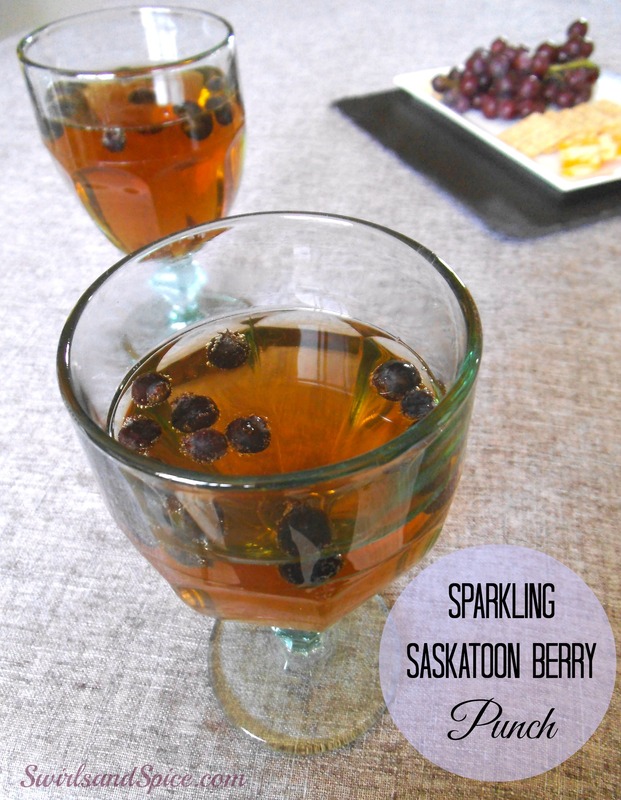 If you are not acquainted with Saskatoon berries, I describe them as a blend of cherry, blueberry, and cranberry flavours and textures. While some Canadians have a strong preference for blueberries, I am enchanted with Saskatoon berries. I tasted them for the first time a few years ago and am delighted to have them in our area now. With the cool spring this year, I am hoping to still be able pick local Saskatoon berries in July after we return from our travels. Last year’s berry picking was a highlight of the summer; we also attended the Saskatoon berry festival, complete with gourmet pies. Those pies weren’t quite as good as the best Saskatoon pie ever, which was made by a friend from church and brought to a potluck dinner. The nice thing about this punch is that it’s easier than pie, and twice as refreshing. Still, I’d gladly take another slice of that homemade Saskatoon berry pie and wash it down with this Saskatoon berry punch. 1. Combine berry juice and ginger ale in a 1:1 ratio. 2. Add berries and serve cold. I share recipes here and I am also bringing this to Fiesta Friday. Those berries sound delicious! Never heard of them! Thanks! It’s nice to be back. I love all these new foods I learn about during fiesta friday! If I ever head toward western Canada, I’ll be sure to seek them out. They have such a cute name too! Thanks for sharing, and have a wonderful weekend! Where do you get them? Here they grow wild and are also sold at Co-op grocery stores. There are Saskatoon berry farms too. I think we got them from the local farm markets around here. I live in BC. I remember Saskatoon berry jam from when I lived in Winnipeg…I had forgotten all about them but the next time I am in Canada….thanks for bringing this refreshing punch to the party – summer is well and truly here and this will go down a treat! Happy Fiesta Friday to you! Thanks, Fae! You’re a lovely hostess! How pretty and refreshing, perfect for our warm weather here. I am new to these berries …I would like to try them. I wish they were distributed more widely. I’ll have to ask my American friends in Oregon and Washington state if they’ve come across them. Thanks for stopping in today! I’ve never heard of saskatoon berries Julia! I love the name! And this punch looks so delicious!! I’d love to try it!! I have a feeling that I’d love those berries… 🙂 Great post! My mom introduced them to me. It’s fun to discover unique local flavours. I tasted buffalo berries here for the first time too. Would love to have some of this punch with you. I remember picking lots of Saskatoon berries near Lloydminster as a child. Your Grandma canned them and made pies and we ate them fresh…even before we got home from picking. So delicious. Simplicity at its best. I live the mock tails like this. Fantastic share. Saskatoon? I gotta find these! Fantastic punch and perfect for the party, thank you for bringing. I have never had saskatoon berries but really would like to try them. The punch looks delicious! !